CHARLESTON, W.V. - OF Pablo Reyes and LHP Stephen Tarpley both saw their first Major League action Sunday afternoon, with Reyes debuting with the Pittsburgh Pirates while Tarpley made his inaugural MLB appearance with the New York Yankees. Reyes and Tarpley are the 74th and 75th former Power players to play in the big leagues. Reyes was used as a pinch hitter for RHP Dovydas Neverauskas in the ninth inning. He flied out in his lone plate appearance during the Pirates' 5-1 loss to the Atlanta Braves. Meanwhile, Tarpley pitched the top of the ninth inning for the Yankees. He allowed three runs on three hits while walking two and picking up his first big league strikeout in New York's 11-7 defeat at the hands of the Detroit Tigers. Both players were a part of the 2015 playoff run for the Power. Reyes hit. 268 with 12 homers and 60 RBI in 108 games and posted 39 extra-base hits with a .783 OPS. Tarpley was a member of the starting rotation for West Virginia, going 11-4 with a 2.48 ERA in 20 starts across 116 innings and recording 105 strikeouts to 25 walks. Tarpley was named a Baseball America Low-A All-Star for his performance during the 2015 campaign, which included hurling the most recent no-hitter in Power history, a six-inning complete game shutout of the Delmarva Shorebirds July 7, 2015. After earning MiLB.com Organizational All-Star honors following his 2017 season with the Double-A Altoona Curve, Reyes nabbed his first non-roster invite to Spring Training in 2018. He broke camp with Altoona, but only spent 12 games at Double-A before being promoted to the Triple-A Indianapolis Indians. Across 122 games this year, Reyes averaged .284 with eight homers and 41 RBI. The 24-year-old logged 591 MiLB games under his belt before making his MLB debut. 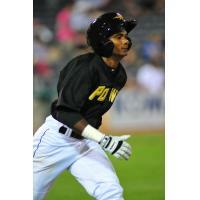 Following his fantastic 2015 campaign, Tarpley was bumped to Advanced-A with the Bradenton Marauders and played the entire season there until August 30, 2016, when he was traded along with OF Tito Polo to the Yankees. Tarpley was converted to a reliever and dominated out of the Tampa Yankees bullpen in 2017, going 6-0 in 14 outings before heading to Double-A. Between Trenton and Triple-A Scranton Wilkes-Barre in 2018, the Los Angeles, Calif., native put together a 7-2 record with a 1.94 ERA in 36 games, picking up two saves over 69.2 innings. He struck out 71 batters compared to 26 walks and held opposing sluggers to a .168 average. Over his MiLB career, the Scottsdale Community College (AZ) product is 34-17 with a 2.92 ERA in 115 appearances (60 starts). He has worked 419 innings in the minors and tallied 396 strikeouts to just 135 walks. Reyes and Tarpley are the ninth and 10th former Power players to make their MLB debuts in 2018, following right-handers Clay Holmes, Colten Brewer, Nick Kingham, Tanner Anderson and Alex McRae, left-hander Daniel Zamora, outfielder Austin Meadows and infielder Kevin Newman. For more information on all of the former Power players who have been in the Majors, visit www.wvpower.com.